Online boutique of London-based graphic art label and artist's platform gets responsive reboot. 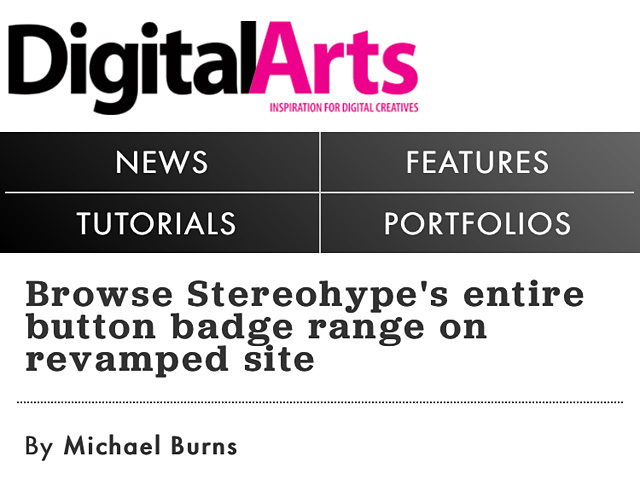 ___ The button badge aficionados at Stereohype have just launched a new website, revamping text and functionality and rejigging all pictures in higher resolution for full display on retina screens. ___ According to co-founder and creative director Tomi Vollauschek, the first version of the Stereohype website was created in 2004. ___ The new site was designed by Stereohype's parent-company, multi-disciplinary design studio FL@33, and programmed by Huck und Fresow. ___ Stereohype’s range includes 1,000 button badges by over 300 contributors, themed button badge gift boxes, books and mags and T-shirts. ___ Users can now explore the entire range on the new site, making use of the new product categories, tags, search filters and a easy-to-browse layout. ___ "We worked for over one year on refreshing the biographies of our contributors, writing and editing texts, preparing pictures in higher resolution so they also look great on retina screens," said Vollauschek. ___ "There's also a freshly extended graphic art section that now also includes originals and more affordable highest quality Giclée and photographic prints – often available now in varying sizes." ___ "The new version was initially meant to be ready for our 10 year celebrations last autumn and in time for our major retrospective exhibition in London," said Vollauschek. "However it ended up teasing us to go the extra mile, which unsurprisingly took a few extra months." ___ "We are very relieved to have added our entire wish list to the new online boutique to make browsing, and buying, our products a pleasant, swift and easy experience." ___ "All pictures were prepared in higher resolution to allow the badges to look as crisp as possible, even on retina screens," continued Vollauschek. "The grid-based, responsive layout allows for as many products to be shown as the browser window allows – a game changer compared to our old website." ___ On desktop computers, users can now click a custom-designed 'add to basket' icon for each product – especially practical for the 1,000-strong button badge collection. ___ Stereohype's 'Button badge of the day', introduced many years ago on social media channels, is now an automated feature on the website. ___ "Every day a random badge is being showcased, and also reduced by a third," explained Vollauschek. "A new zoom function allows a closer look at the cute little mini canvases that are our badges." ___ “The other crucial addition is the added functionality to allow the website to be a wholesale platform where prices change for registered Stereohype stockists and contributors," continued Vollauschek. ___ The new website was optimised for iPad and iPhone 6/6+. ___ "On touchscreen devices you have to click twice as the rollover function does not exist for these devices," said Tomi "We still wanted to offer the alternative, in-depth info page on there, however."